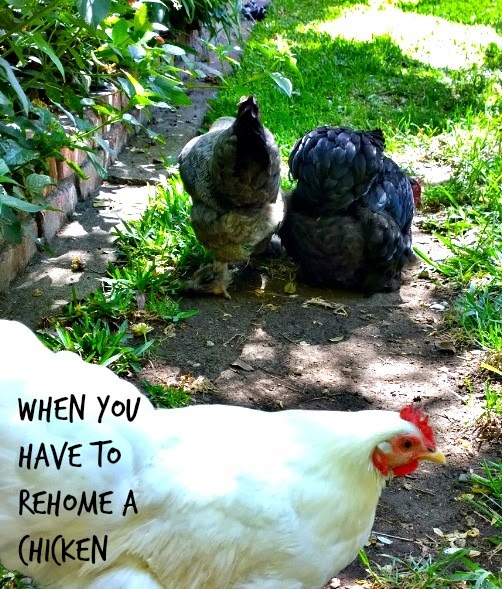 Owning chickens is not always fun and you may be at a point when you have to rehome a chicken from your flock. If you have a chicken that is upsetting your flock you have to make a choice. Sometimes you have to make hard decisions when a member of your flock just does not fit. Here is the story of how we had to rehome Cupcake, our white bantam cochin who later became known as Big Momma. Last summer I brought home these three bantam chickens and I was a fan of bantams from the first day. All seemed to be fine, flock was getting along and all was peaceful until this year when the white cochin, Cupcake, went broody. Now a broody hen can be a real challenge but this girl became just awful. She was very mean and aggressive with our grey brahma. Literally trying to peck it to death. Over the months this chicken became broody about once a month. I went through all the steps of breaking her broodiness each time. She was a challenge. As each period of broodiness ended, she was remaining aggressive. I removed her from the flock to try and change the dynamic but it was her, not just a pecking order. Some folks may have multiple coops where they can move chickens around but I do not and I also have two pullets that need to be integrated into our coop soon. I was worried for their safety as well. I knew I needed to find an answer for this chicken. Putting this girl in the stew pot was what some told me to do but that was never going to happen. I felt that she needed to find a home with a standard sized flock where the larger sized chickens could keep her in check and she would not be such a dominant nasty girl. I was very lucky to find someone who wanted her and also wanted a broody chicken for hatching eggs. I knew when they asked when her birthday was so she could have a celebration each year, she would be loved. Reports are that she is doing fine in her new coop and has been getting along fine with the new large flock. 1. Ask other chicken owners you know if they could use your chicken in their flock. You may have a broody like me and she can be put to good use to sit on eggs. 2. Check online chicken boards. This is how I found the new home for our chicken. We met at a park to pass the chicken. Some folks don't like to have other chicken owners in their coop without biosecurity measures. I was just trying to meet him half way. 3. You could list the chicken on craigslist. You may not know exactly where your chicken will go but this is an option. I wanted to see if she could be of use to someone else so I did not go this route. Im glad you could rehome her!! I have not yet had a broody chicken. Phew!! I agree. When they ask when the birthday is, you know you've found the right folks. You ARE lucky to have found a good home for her! I hate it when you get a nasty tempered hen, but it happens. It's actually very upsetting when you have a chicken war going on. I've had struggles with it. I'm down to only 2 chickens right now and there is no pecking order with 2. That will all change when I add to the flock again and I'm not looking forward to it!